Includes Elite Dart blaster, MEGA Dart Barrel Extension, Missile Launcher Stock, 10 Elite Darts, 10-dart clip, 4 MEGA darts, missile, bolt (2 pieces) and instructions. 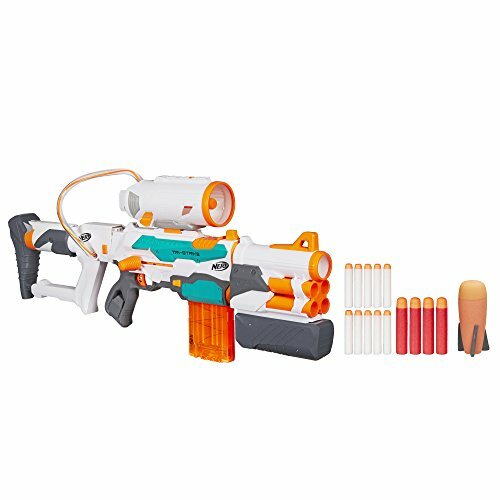 Build your own blaster for each mission with the Nerf Modulus Tri-Strike blaster from Hasbro! The Tri-Strike blaster featurs 3 different ways to blast that can all be used separately, or combined, for custom configurations. Bring an entire arsenal to the battlefield with the versatility and power of the Tri-Strike blaster! Start building with the Elite Dart Blaster and attachable 10-dart clip combo. Precision-fire Elite darts or fire 10 in a row using rapid-sliding-bolt-action! Extend the barrel with the Mega Barrel Extension. Then fire Mega darts with this big barrel’s increased range.